Geomorphology (often described as physiography in earlier times) has often been used in its broader context to classify land at a broad level in order to understand the land in terms of form and process. The Statewide Land Systems, first developed by Rowan (1990), used geomorphology in this context and provides a two tier hierarchical approach which was developed by Jenkin and Rowan (1987). 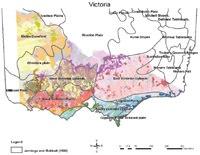 The top tier of this approach is the geomorphic zone, of which nine were designated to cover the State of Victoria eg. the Murray Basin Plains. The second tier of this scheme consists of twenty-nine geomorphic units (eg. riverine plain), which are subsets of the first tier zones and are portrayed at a scale of 1:1 million or 1:500 000. These geomorphic units provide the framework for the land systems that are patterns of land type. They are generally portrayed at a scale of 1:250 000 and often have subdivisions or components at a finer scale. The existing geomorphological framework is based primarily on the work of Hills (1975) and predominantly uses form (morphology) as the major factor in the determination of geomorphological areas. Lesser emphasis is placed on geological structure and subsurface processes. As part of a review of the Statewide Land System approach it was decided that a review of the geomorphological framework would also be useful. The use of newly available technology such as gamma radiation imaging (radiometrics), digital elevation models (DEM’s), research into (geological) regolith mapping, geological structural mapping and old fashioned soil survey, have provided new insights into the distribution of land types, their likely genesis and their behaviour under different external forces. These units provide a framework that helps us to understand the vegetation type distribution as well as the soil type distribution and hence has some bearing on natural habitat distribution for fauna and flora. The Geomorphology Reference Group (GRG) was established in 1995 by a group of interested parties with the aim of reviewing the Geomorphic Division of Victoria, primarily as a framework for the evolving Statewide Land Systems and contributing studies. The descriptions given below are based on developments put forward by the group. These developments are ongoing. The context for the geomorphic divisions of Victoria is shown in the diagram of South Eastern Australia. This map provides an overview of the broad geomorphic divisions of south eastern Australia as portrayed by Hills (1975) at an approximate scale of 1:10 million. This map highlights the continuity of geomorphic divisions across State boundaries, particularly the Murray River Basin. Major Physical Divisions of South eastern Australia (adapted from Hills 1975). While the Murray River provides a natural boundary for much of Victoria, there are areas to the west and east where there is no natural boundary to the State of Victoria. Large landform features occur across the State border such as the Big and Little Deserts in the west and the Australian Alps and the Monaro Plateau to the East. A brief outline of the evolving statewide geomorphic approach is given in the historical perspective section. The Geomorphic Reference Group (GRG) have proposed that there should be seven major geomorphic divisions of Victoria with twenty seven second tier subdivisions and seventy-seven third tier units. This plan is yet to be discussed and finalised.